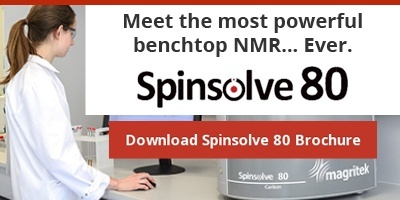 We are really excited to introduce the newest Spinsolve benchtop NMR – the 80MHz Spinsolve 80. Spinsolve 80 combines industry leading resolution (0.5 Hz/20 Hz) and the highest sensitivity and chemical shift dispersion with an unparalleled 80 MHz magnet at its core. All Spinsolve benchtop NMR systems include easy to use software, convenient size and weight, and superior stability to give you quick and convenient NMR spectroscopy, wherever you want it. If you have any other questions about Spinsolve 80, or any of our products, please contact us.